Petra Kvitova ended hopes of a home Australian Open winner with a commanding 6-1 6-4 quarter-final victory over Ashleigh Barty. The mightily impressive Czech continued her record of not dropping a set this tournament, with her exquisite movement and power enabling her to book a maiden last-four appearance in Melbourne. Barty was aiming to become the first Australian woman to reach a singles semi-final since Wendy Turnbull in 1984, but was never able to gain a foothold in the match. An emotional Kvitova was in tears during her on-court interview after the match and she can now focus on a first slam semi-final since she won Wimbledon in 2014, while it is the furthest she has gone in a major since returning from a knife attack in her home in December 2016. "I didn't really imagine being back on this great stadium and playing with the best. It's great," Kvitova said. Kvitova had Barty under pressure as early as the second game and the home star had already saved a couple of break points before putting a forehand wide to cede the first break. Barty was playing like the proverbial rabbit in the headlights, while the cool Kvitova was quick around the court and landing punishing winners. It came as little surprise when a second break arrived, converted with an exquisite drop-shot, before Kvitova duly served out for the set. Encouraged by a partisan Rod Laver Arena crowd, Barty settled and had Kvitova on the back foot with a couple of break points early in the second set. 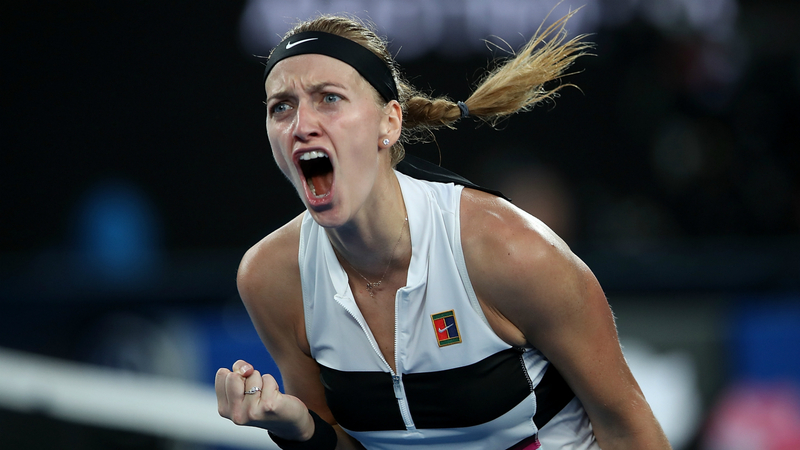 But Kvitova stood firm and, after each player coasted through a couple of easy holds, took her opportunity with aplomb in game nine – putting away a clinical shot from mid-court to take control before breaking to 15. Kvitova then served out at the first time of asking to book a last-four date with Danielle Collins.